We are very sorry to announce that as of June 1st 2014 we will no longer be accepting donations for the charities registered with us. It's been an extremely difficult decision but we have decided to close the website. While we have loved running it and helping charities and donors get together, we have not been able to make it the success we were hoping it would be. Since the launch we have been supporting the site with our own money and are unfortunately no longer able to do this. You can still log-in and use the built-in messaging service to talk to each-other and we will be continuing to keep the site live for the next 6 months or so. In the meantime we will be paying all the donations we still hold to the charities, without any fees being applied. Once again please accept our sincere apologies for this sad news, we truly wish it could be otherwise. Ploinking is easy! Start by finding a charity and click 'support' on their profile page. 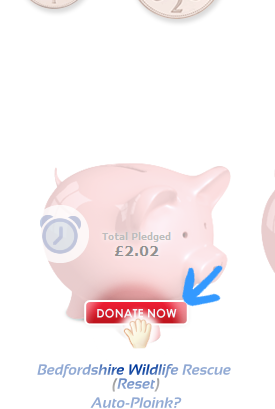 Go to your home page and you'll see the charity piggy bank will have appeared! Now you're ready to ploink! 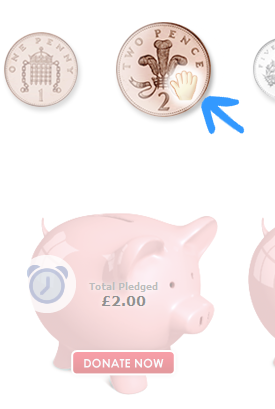 Step 1: Move your pointer over the coin you want to put in the piggy bank. Step 2: Click on it and drag it to a piggy bank and let go. The total amount will go up with each coin. 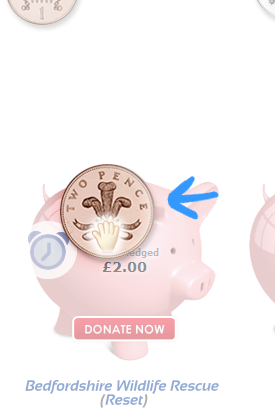 Step 3: When you have at least 99p in the piggy bank the 'donate now' button will activate for you to click and donate.